Winning the Super Bowl two years in a row is incredibly difficult. That's not to say I didn't have hope for the Giants, but they lost today. That means baseball season officially starts for me right now. Let's go preseason talks. Tell me how the Yankees are buying all the players, yet still playing within the rules of the game. Tell me how the Mets are not choke artist and will beat Philadelphia this year and not cave at the end of the season. Tell me how baseball players aren't really in it for the money and for the love of the game. Tell me how many Jeter cards I'm going to crave in 2009 and not get. 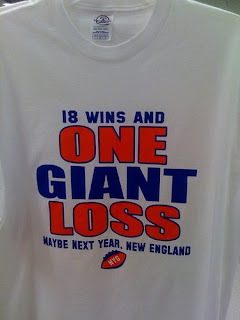 By the way, the New York Gaints are still Super Bowl champs until Feb. 1. I thought this was a baseball blog... No football allowed. Sorry about the Giants. No not really. Its a few weeks hopefully before my baseball season starts. To quote Ralphie on "A Christmas Story": "Football? What's a football?" "Tell me how baseball players aren't really in it for the money and for the love of the game." Ask the Twins and Royals. P.S. Today's captcha is "foratio." Yeah, I'm not even gonna touch that one. I love "A Christmas Story". "You'll shoot your eye out." The Phillies WILL beat the Mets again this season...that much I can tell you. From the ultimate Phillies fan...but for me, baseball season started on the day MLB TV launched a week and a half ago. Right now I am enjoying the Pirates and Cubs from April of 1991. 11 runs in the 11th inning..amazing. 24 started yesterday and it was awesome. Hours 3-4 are tonight!